Our first contact with the University of Kingston was in 2006 when were were asked whether we would like to donate an Ecopod into a reference collection, held by university, of items made from recycled materials. 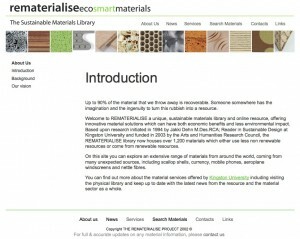 The instigator of the project, Jakki Dehn, is an internationally recognised specialist in recycled and sustainable materials and you can learn more about this extensive and important resource at www.rematerialise.org. In September we were invited by Jakki Dehn to help set a brief to the second year students on the BA Hons Product & Furniture Design course, entitled ‘Closing the Loop – the creative and economic potential of the end of life and how to support related communities’. This was a challenging project and the solutions that we saw at a presentation by the students on 2nd November 2011 were wonderfully imaginative, bold and refreshingly uninhibited by the constraints and expectations of a more traditional approach to death and bereavement. Kingston University and MCC Business Solutions recently set up a new venture for exploring green growth within an existing business, and set up a number of Green Growth workshops during November 2011 to companies to achieve success. Run by specialists and entrepreneurs at Kingston University the series addresses the increasing need to develop environmentally friendly products and services. Green Growth Boot Camp was officially launched by the Mayor of London, Boris Johnson, who’s office has partially funded the venture, and we were pleased to be able to support Kingston University at the launch on 13th October 2011 by exhibiting the Ecopod at the Open Day. 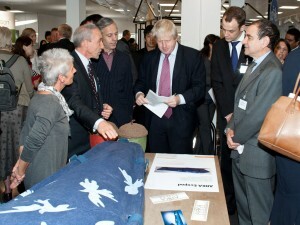 Boris Johnson found the Ecopod particulalry interesting and spent several minutes talking to us about it. You can hear more about what he said in the speech he gave at the university to launch the Green Boot Camp clicking this link to YouTube. The Rematerialise web page and the image of Boris Johnson with the Ecopod are copyright to the University of Kingston and used with permission.